Nancy is technically challenged. Actually that is not quite true. She is just challenged. Period. And that includes technology. A friend has given her an Ipad mini as a gift, telling her that it is very easy to use and will be great for keeping in contact with friends and family while she is traveling. We already know that Nancy does not do emails. She has never learned to type, even with one finger, and the sight of a keyboard confuses her because the letters are not in alphabetical order. We have had one email from her in the year since we first met her. It was two lines long, all in upper case with no punctuation. Much like her speech, it made little sense and was hard to follow. She told us that we were honoured to get that email as it is one of the very few she has ever written and it took her over half an hour to write. So the Ipad is totally beyond her capabilities. She has asked Gordon to help her with it but even his incredible patience is put to the test. One of the first questions she has, (she is holding the Ipad in the portrait position) is that one time when she was looking at pictures, the image was wider than it is now, and she prefers that. Gordon has to show her how to turn the Ipad 90 degrees to the landscape position. Voila! We try to keep a straight face, but Nancy just falls about laughing. After the first lesson we set out to explore the port of call for the day. We are in Manta, Ecuador a large bustling seaport and industrial city with nothing much going for it other than the town of Montecristi twenty miles away. This is a small town famous as the manufacturing center for Panama hats and described in the ship’s literature as being charming with its faded elegance. We find later it is certainly faded, but shows few signs of ever having been elegant, or of having any charm. With Gordon navigating, we set off in a north easterly direction from Manta, which is rather unfortunate as Montecristi lies to the South East. We drive for fifty miles wondering where the town could be, before we realise our mistake (by that I mean Gordon’s mistake, but I am far too nice to put it as bluntly as that). 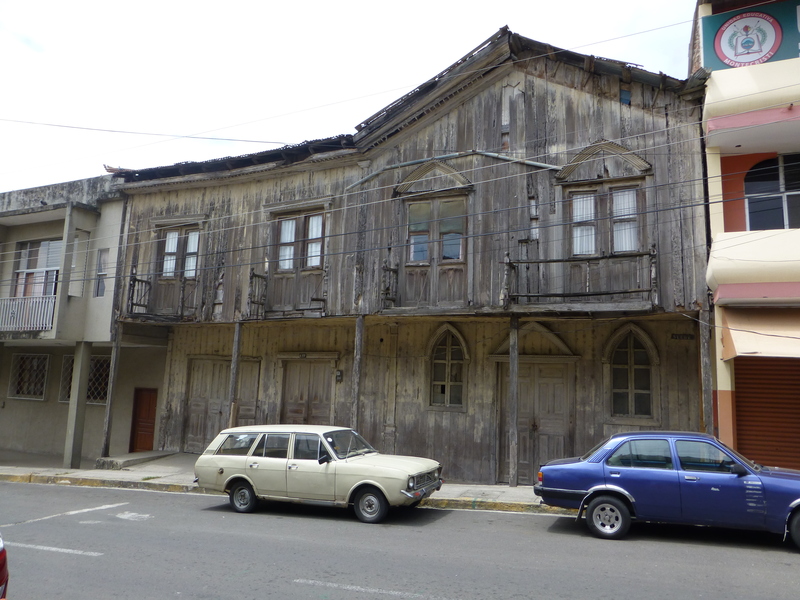 But the drive is fascinating revealing, as it does, a lot about the Ecuadorian people and the countryside. The road is a good main road lined with shacks selling coconuts and ice cream, and that is it, other than the occasional entrepreneur mixing the two together and selling coconut ice cream. It all looks very much the same until we pass a high wall about 100 feet long, painted pink with a huge sign saying “Chocolate Delights”. Margaret is a chocolate lover and insists that we stop and try the merchandise. We do a U turn in the road and drive back to the pink wall. But there is no sign of a shop, or a doorway, just the pink wall and the sign. Confused we drive slowly by the wall until we notice a paved driveway at one end curving round behind the wall. Thinking this must lead to a factory we follow the road round. It leads to a small house painted in the same shade of pink. But now there are walls on either side of the driveway and on the walls are large photographs of dark skinned ladies ( I use that term loosely) in provocative poses. The most any of them is wearing is a pair of strategically placed tassels. As we approach the house, the front door opens and a large woman in a colourful dress several sizes too small and a cigarette dangling from one side of her mouth comes out to greet us. I am not sure who is more surprised, Margaret and Nancy at being delivered to the front door of a whorehouse, or the Madam getting ready to greet two elderly white women to her Chocolate Delights. As we beat a hasty retreat and accelerate down the main road we realise we are not in the best of neighborhoods. There are now many more of these painted walls lining the road and behind each one is a motel carefully hidden from view. Being virtually invisible from the street means that tourists driving by have no way of telling the class or quality of the motel. The only hint anyone has to go on is their names which cleverly reveal just enough information to attract the appropriate clientele. We pass such motels as “Happy Hour Motel”, “The Love Nest” “Casa D’Amour” and “Honey Moon Motel”. If the names aren’t sufficient advertising, most have a large billboard depicting a young attractive couple entwined in an amorous embrace. This is enough for even Nancy to get the point. We later discover that these motels do not rent by the hour as we had assumed. Instead they rent by the three hours. Clearly the Ecuadorians take their time. Perhaps it is the humidity that demands all physical activities are done slowly. In the States I understand that similar hotels rent by the hour and the full hour is rarely used. Giggling like school children we make our escape from the neighborhood and continue on to Montecristi. 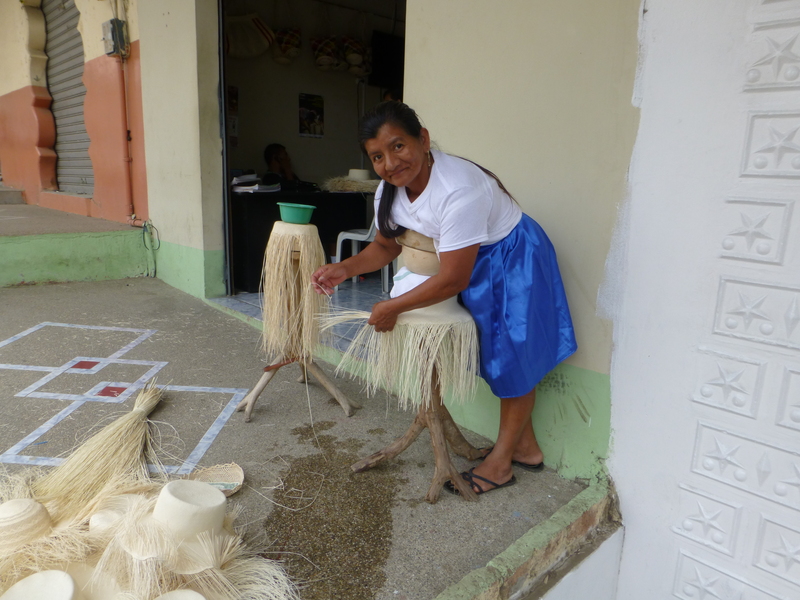 The town square is surrounded by tiny workshops where the famous Panama hats are being made. I had read that these hats were all made by hand and can take up to two months to make depending on the quality. I had assumed we would see rows of tired, worn out Ecuadorian native women sitting at benches for ten hours a day, carefully weaving the hats. But sitting at a bench would be a luxury for these poor women. They spend their days working like this We are never told why this uncomfortable position is necessary but I suspect that it is just a lot more photogenic for the tourists. The cost of these hats is quite shocking. The best quality hats (which can be washed) are priced at $180, but as they take a very uncomfortable woman two months to make, then perhaps they are worth it. Er I think that’s chocoholic! !